This Seller Server Classes training course is offered in both English and Spanish for both On-Premises and Off-Premises courses. The two-hour course covers basic definitions, state laws relating to selling and serving alcohol, information regarding underaged and intoxicated customers, Dram Shop laws, and much more. Students can study the course at their own pace, check their knowledge with the course’s helpful “Knowledge Check” sections, and once complete, print their Oklahoma Seller Server certificate. 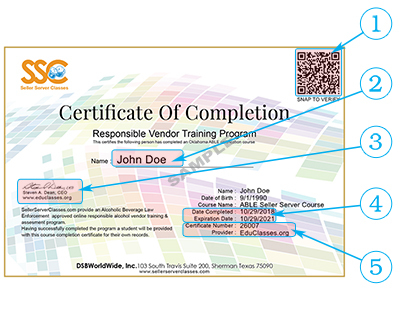 Click the image below to view a sample of your state Seller Server Certificate with explanation!